Participate in the Observer's game to win the mages' freedom. 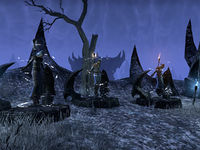 I discovered the Cliffs of Failure, where Molag Bal's failed servants compete to get back into his good graces. Lost members of the Mages Guild have been ensnared in this twisted game, and I need to join in to save them. Take the Portal to the Battlegrounds Antechamber. Find and aid the mages. Return to the Observer and choose a side. Estre: "Your troops grow weak, Thallik. The Worm Cult isn't what it once was. And this mage isn't going to change that." Thallik: "You throw peasants at me, Estre. You confuse weakness with boredom. My mage will do just fine." Estre: "Believe what you will. When I am victorious and you grovel before me, I will remind you of this moment and how wrong you were." Angof: "You two bicker like a couple of married old Nords. You didn't even notice the new arrival." Estre: "Another one? Where do they all come from? I swear, they pop up like rabbits." Angof: "This one is different. Special. I think this one will make a good addition to my team." The Observer gives you the quest and sends you off to find the mages. If you have the Fighter's Guild perk you can try to intimidate him but it doesn't change the quest progress at this point. After crossing the Battlegrounds Antechamber and entering the Cliffs of Failure proper you see Mim leaving Juline wounded and apoligizing for his betrayal. Mim: "This one is so sorry, Juline. I do this because I must. One of us has to make it out of here and get back to our mission." Juline Ginis: "Why, my dear friend? Why have you done this?" Speaking with Juline she expresses her refusal to be a pawn in the game. Mim stabbed her and Relmus left them as soon as they were put in play. She is the chosen pawn of Angof. She gives you the seeds Angof gave her to plant in corpses. Heritance soldiers are to the east in the zone and once slain can be planted with Angof's seeds. They then turn into zombies and run off before vanishing. Killing multiple soldiers at once will only give you one zombie. Planting seeds immediately after killing each one may work. Once done you return to find Angof crouching almost sympathetically beside the stricken Juline. He is dismissive of you now that you have completed his task. Mim crouches due south further away by the corpses of three zombies. He responds aggressivly when you speak to him. He is Thallik's chosen pawn and was given a "useless" rune by him. He gives it to you with instructions to find Thallik's rune circle a little northwest of him. Thallik himself stands there and explains the rune's nature and capabilities. Activate the rune in the circle and kill any enemies to charge it. The rune grants you Thallik's Embrace and has a limited duration but the 5 minutes is more than enough time for the objective. Once completed you return to find Mim in a more compassionate frame of mind and he bids you help his companions as well. Relmus stands on the edge of a precipice sobbing when you find him. You talk him down and he expresses similar sentiments to Juline but has lost Estre's shadow. His refusal to participate caused the shadow to declare him unworthy and leave. The shadow is a Shadow Court Jester and is on a platform back near the entrance not far from Juline. It will join you if you find Lady Estre's mask. It is broken into pieces and the clues are in rhyme. Shadow Court Jester: Three pieces to find, each of a kind. The first below the rock bridge, where the spiky vines live. The second one stays, near where the river meets my gaze. And the third piece sits, by the frozen giant's bits. So now we are intertwined! The riddle helps a little but the quest markers help a lot more. Once you've found the mask Lady Estre herself appears by the Shadow Court Jester and Relmus kneels submissively near her. She offers that you join her against the others. After helping all three mages you return to the Observer's Watch to choose your side and complete the quest. I need to locate the Mages Guild members and talk to them about their role in this game. I might be able to use what I learn to free them. Objective Hint: I placed Angof's seeds, I should return to Juline and let her know. Objective Hint: The death rune will transform me if I use it at a rune circle. Objective Hint: I have a limited amount of time in this necromantic form to fill the death rune with the essences of those I slay. Objective Hint: I charged the death rune. I should return to Mim to let him know what I did. Objective Hint: This Shadow Court Jester has suggested I seek out Estre's mask, which was Relmus's original task. Upon collecting them, I might be able to convince them that Relmus succeeded. Objective Hint: I found the three pieces of Lady Estre's broken mask. I should return them to the shadow. I need to return to the Observer's Watch, the floating platform above the Cliffs of Failure. I should speak to the Observer and determine what my next steps in this game are as I try to set the Mages Guild members free.